MARCO UBER BAR, LONDON, MAY 20 - Marco Beverage Systems Ltd. Since we let the US Barista community have a play with the Uber Boiler at the WBC Bar in Atlanta less than three weeks ago, the UberProject now has to turn its gaze to dear ol’ Blighty, as the UK Coffee Community’s annual shindig, Caffe Culture , gets under way on May 20th, less than two weeks from now. Marco has a 5m x 3m space in Caffe Culture (Booth E41) and we have taken a decision which may be just plain silly. Rather than having a Marco ‘corporate’ booth, we will have the Marco Uber Bar, featuring three Uber Boilers, two of which will be coffee brew-stations and the other will be a tea station. I am delighted James Hoffmann and Anette Moldvaer will man the machines with yours truly at the Uber Bar featuring their magnificent Square Mile coffees. We will be brewing predominantly French Press with the odd Chemex thrown in. On the other Uber Boiler, I am similarly chuffed to report John Kennedy of Teasmith will be brewing a selection of their exceptional speciality teas. 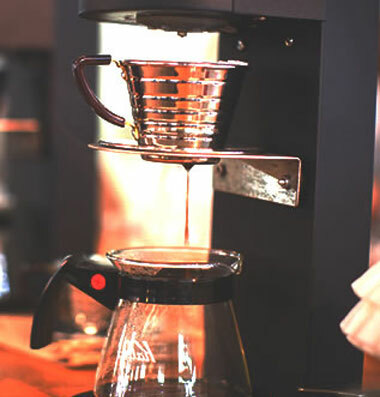 I am really excited about having industry experts from Square Mile Coffee Roasters and Teasmith, representing the very best of the Speciality Coffee and Tea worlds to work the Uber Bar at Caffe Culture. If you are at the show, please drop by, taste some fine coffee and tea and talk to us about your beverage and brewing needs. Why an Uber Bar and not show our full range? Put simply, we wanted to use the space in a novel way to illustrate to the industry we know alittle about brewing and continue to strive for innovative solutions to meet the industry’s latent needs.